On Friday, April 22, at the corner of H and Calzada, in Vedado, Havana, I was intercepted at 3:45 pm by a Lada car without police plates, out of which came four security agents in plain clothes. Surprised, I tried to ask for the warrant; meanwhile the driver commands, “Get in, Iturria your time has come!” And one of the two gendarmes punches me and pushes me in with the help of another. In the vehicle they stripped me of my belongings (cell phone, camera, book, papers and identity card). Already underway, they went down G Street to 23rd and from there to 41st and 31st. At the Marianao Military Hospital they turned to Siboney and got out at the San Augustine police station in the municipality of La Lisa. Part of the way they kept me with my arms behind me and my head down. The driver responded to phone calls on his mobile with phrases like “I’m bringing the charge, call later”, or “get ten teams and wait in Section 30.” At his side an officer in his fifties, tall, black, thick lips and a face of disgust; the only one wearing military boots. At the station they searched me thoroughly. I was in the lobby under the supervision of the guy who punched me — a swarthy thirty-something with a face full of hatred — and the young mulatto from the back seat, until an officer took me to a shabby office, where one of the military who was at my house on March 8, when I refused a summons to an interview with the “official Octavio,” came looking for two chairs; but Captain Tamayo came and moved me to a room with air conditioning, beginning the repetitive “verbal exchange” with Tamayo, escorted by subordinated who were at the house, both brave little things, and silent. Tamayo is white, of medium height and light eyes. He suffers from oral incontinence and likes to dazzle with statistics showing State Security’s control of the peaceful opposition, exile organizations, independent journalists and alternative bloggers, whom he incessantly denigrates and minimizes, which contradicts the low importance he gives them. Speaks of his farming background and the poverty of his family, he was born in a hamlet in the Sierra Maestra in the Contramaestre municipality, Santiago de Cuba province. 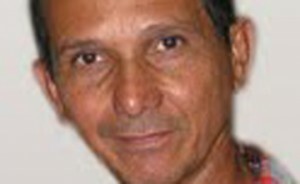 He reiterates that has 23 years in the Ministry of Interior, where he barely earns enough to eat despite having a house in Havana and being a communist. He regrets not being able to have a bottle of rum every week and to bring boxes with gifts to relatives in the mountains. Faced with a mentality so codified, I limit myself to asking some ironic questions and clarifying certain views with conflicting data. I told him that he serves a totalitarian tyranny, not a socialist revolution, that what’s left are the slogans, rituals and masks of the most frightened who depend on the State, increasingly like a Arab sultanate; that the economic embargo and the alleged external aggressions are not the causes of the national disaster, rather it’s the inefficiency, corruption and lack of freedoms and opportunities to unleash the productive forces and citizen initiatives. At eight pm, the officer handed me my belongings as a “goodwill gesture” in the hopes that I would not “make a circus out of what happened.” I assure him that I will continue to write without censorship, and will denounce the abduction arranged by him.